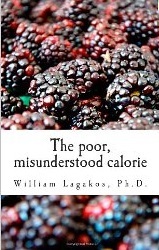 Over the past couple of weeks, I had the pleasure of reading (slowly, when I had time) an excellent book about calories, nutrient partitioning and (yes) fat loss: The poor, misunderstood calorie by Dr. William Lagakos. Dr. Lagakos has a Ph.D. in Nutritional Biochemistry and Physiology. He’s done quite a bit of research in the fields of energy balance, lipid metabolism and insulin resistance, and writes frequent posts on his blog. I wasn’t aware of his work until recently, when for some reason he started showing up in my Twitter feed. (I have no idea how people I don’t know end up in my feed.) I was intrigued by his tweets, so I checked out his blog and was pleased to discover that he writes for a lay audience. So I bought his book (which, by the way, he didn’t ask me to review). If you’re looking for a how-to book, this isn’t it. There’s no diet plan inside. But if you’re looking for an explanation of the science of energy balance and weight loss that’s clearly written and easy to grasp, this is definitely one for your bookshelf. Counting calories is an ineffective means to determine energy balance or lose weight. The calories in food are not the same as those expended by the body. The poor, misunderstood calorie explains the concept of calories in the context of nutrition, obesity, and appetite. And that’s exactly what the book does. In the opening chapters, Dr. Lagakos explains what a calorie is and how calories are measured, both in food and as energy expended in clinical settings. Then he devotes a couple of chapters to explaining why your body doesn’t work like a bomb calorimeter. Strangely enough, your body works like a body. It makes decisions about what to do with the calories. I suspect that a few calorie fanatics out in cyberspace won’t bother actually reading the book but will nonetheless insist that Dr. Lagakos is trying to deny the laws of thermodynamics. He isn’t. Nowhere in the book does he claim that calories magically disappear or that a particular macronutrient ratio will allow you to overeat and still lose weight. His main point is that the tendency to either accumulate or shed body fat is driven by the relationship between nutrient partitioning, energy expenditure and appetite. What we eat – not just how much – affects all three. As he explains, if you simply restrict calories, you may (depending on which foods you’ve restricted) ramp up your appetite, reduce your resting energy expenditure and partition nutrients in the wrong direction – away from building or maintaining lean muscle mass, for example. That’s a prescription for failure. If, on the other hand, your diet has the effect of moving you away from fat storage and towards fat burning, nobody will have to tell you to eat less. You’ll naturally want to eat less. If your diet also builds helps muscle, your metabolism will rise. Water quenches thirst. Food should satisfy hunger. Calories should satisfy hunger equally if they are providing the same amount of energy to the body. But calories from fat and protein satiate better than calories from carbohydrates. This logic supports that all calories are not the same, due to their effects on appetite. If the focus were to shift from strictly energy balance to weight loss, this may be the more important interpretation of the energy debate. Combined with the fat-storing effects of insulin, the conclusion must be that all calories are not the same. Biochemists believe that obesity is caused by positive energy balance. Nutritionists believe obesity is caused by excessive fat storage. A suitable compromise might read as follows: carb-rich foods are easily over-eaten, producing a positive energy balance. The accompanying elevations in insulin cause net fat storage … Maybe all calories are calories, but not all calories are equally obesogenic. It only takes a little bit of insulin to completely inhibit lipolysis. On the other hand, insulin has anabolic (muscle building) effects on skeletal muscle. Thus, we want to minimize the effects of insulin on fat storage in adipose while maximizing it on anabolism in muscle. To put things in perspective, however, the effects of insulin on fat storage are quantitatively more robust than its effects on muscle anabolism. Furthermore, this demonstrates that a particular hormonal milieu, in this example elevated growth hormone, is capable of regulating fat mass independent of energy balance. This is one of the main principles of The poor, misunderstood calorie. This is not a Good Calories, Bad Calories-sized tome. The book is about 300 pages with fairly large text and, like I mentioned before, it’s easy to read. I hope you do just that. I’m on a campaign to drop the word “calorie” from discussions of nutrition/human metabolism. Good luck there… Calorie is a unit of measurement of energy. To remove it, you need to calculate an alternative, give it a name, then get everyon to know about it. You could use Kilojoules, usually shortened to joules. Bit since that is metric, I doubt Americans will go for it..
Calories are fictitious, they NEVER mattered as far as making fat tissue. What matters is hormones, genetics, and overal carbon ATOM absorption in the blood. How about “grams” or “ounces”? I know this is simplistic (like the calorie isn’t) but if I eat 8 ounces of steak and immediately weigh myself, I will weigh 8 ounces more. Guaranteed. Same as if I drink 8 ounces (weight, not fluid measure) of water. That is interesting you get that result. I’ve done the same experiment and I have never gotten a 1:1 ratio. Nor have I been able to work out any pattern as to whether my scale shows more than the amount I ate or less depending on what I ate. It seems logical that the body should register that exact change right after you ingest before it has had a chance to process anything. But then I would guess that when digestion begins things start to shift. I’ve never been able to get to that part of the experiment. Grammar police. Wee ooo wee ooo wee ooo. Thank you. I tend not to spot my own typos and missing words. My brain fills in what I think I wrote. You and everybody else who writes. Write on! Yep. I do check my posts before hitting submit and am still appalled at what my brain fills in for me. I just hope I don’t sound too ignorant. And I say this in the face of an Internet that as a whole seems determined to dismantle the English language entirely. I refuse to participate. Glad you like the book too, Tom! I reviewed it a couple of weeks ago on CarbsaneR. It’s so nice to have someone with real qualifications and experience writing so clearly about the subject. When he acquires a degree in metallurgy, perhaps the rest of the world will listen to him. 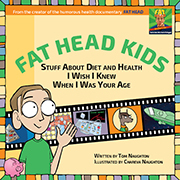 I hope that with more new books challenging Calories-In-Calories-Out, the mainstream attitude about nutrition will change. Tuesday, when I was at Barnes and Noble browsing the diet section, I was impressed at the number of low-carb and Paleo books. I laughed at the “Low Carb for Dummies” book. Today I met another person eating a bunless burger at Etno Grill in Chicago. I had overheard him mention, “Diet”. I had introduced myself, but he received an ill-timed phone call. He could have been shy or busy, but I was happy to see him. A LCHF diet can be difficult when we feel alone, against everyone. Meeting other Fatarians is encouraging. Is common knowledge slowly changing? I believe so, and I believe that will continue. It’s the Wisdom of Crowds effect kicking in. I hear that. Back before I was doing low-carb, it was something of a “fad” so a lot of restaurants were offering low-carb options (bunless, etc.). It seems like now, to the general public, it’s a fad that’s over, and I never hear anyone talk about low-carb anymore unless they’re bashing it. Now, whenever I go to Five Guys (which is about weekly =P) I can always tell which order on the counter is mine because it’s the only one that has a big lettuce leaf sitting there instead of a bun. I love that they offer that, and don’t bat an eye when you request it. Except sometimes the cashier will have to ask someone which button to push. And their burgers are delicious. i recently encountered this guy on the gnolls.org recent update, have not started reading his blog yet though. also just now reading the last book i got for christmas so this is a new one to add to my wishlist. It’s a good blog to have on your reading list. So is gnolls.org. Yup, I’ve been following that one. Great stuff. This sounds like a good book for Doctors to read. One that will appeal to their science training, and will give them a possible handle on how to help their large patients, not just play the shame game and then frustrate them with bad advise. Doctors should read Good Calories, Bad Calories as well, but I’m not sure how many do. I fear that for many, it will go over their heads. I was bold enough to give a copy of GCBC to my primary care doctor. It took him two years to read it. But, he did say that he agreed with most of what Gary Taubes had to say. There are some doctors here in the Pittsburgh area that “get it.” One is Dr. Joseph Maroon, who wrote “The Longevity Factor” – also a good read. Cheers to the doctor for reading it. Hi Mike, I’m in Pittsburgh too. Another doctor who ‘gets it’ is Dr Lauren Loya. Thanks for the name, Kynykya211. I’ll pass it along to my better half – she also follows the low-carb diet and does well with it. It makes following the diet much easier if your spouse also follows it. I first heard of nutrient partitioning a year or two ago on a bodybuilding blog. Exercise nutrition really is way ahead of the domestic market. It’s not senior-citizen large text. It’s just not small, like in GCBC. I can strain my eyes reading that one. Thanks for this review, and for pointing me to what looks like an interesting blog. Adding this to my Kindle library and moving it up to first in the queue to read. Sounds like a great book. Also want to check out his blog and add it to my bookmarks. Thanks so much for this. Thank you for what looks to be like another excellent recommendation. 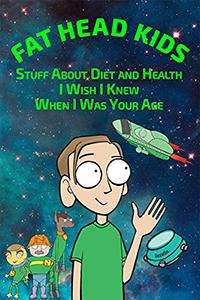 I thoroughly enjoyed Gary Taubes’ “Why We Get Fat” and am confident that as more and more information comes to light, the standard “calories in – calories out” rule of weight loss will finally go the way of the dinosaur. I don’t understand Twitter stuff. Wish he had a blog instead. I went to McDonald’s today — the first time in quite awhile — because I ran out of coffee and my office, and at first thought that this most divine of beverages was free of charge. Then I realized that (in addition to their website, and poster on the wall) McDonald’s now has the calorie count on their big menu behind the counter [coffee having zero calories — in all sizes, no less]. I presume it is a pre-emptive strike to an Obama-Care(less) requirement. Just when science is getting away from calorie counting, the Gov’t is entrenching it even further. In some states, calorie counts are already required … despite not doing any good. I like seeing how many calories I can get for my money. Starbucks requires calorie counts now as well. That’ll solve the obesity issue. One thing you can say to diehard CICO people is if your body takes up all food and calories you eat, then why do we expel solid waste on a regular basis? It is calories the body did not process. Amazing how many people miss that part of calories out. While watching various Youtube video’s with Dr. Robert Lustig I came across this video from an RD that tries to refute his claims. The problem we have is that for every good doctor or scientist out there posting facts there are 10,000 idiots that post the tried to death and still untrue approach to health and weight loss. That’s the dietitian who got smacked down by Lustig on a radio show. Notice she’s a “consultant to the Corn Refiners Association.” ‘Nuff said. Chareva could live on Durianrider’s diet without getting fat too. But unlike him, she’s smart enough to know that doesn’t mean everyone else can do the same. What’s often missing from discussions about calories is that the FDA allows nutrition labels to be off by 20% for calories and carbs. So you really have no idea. And even if the label were accurate, that doesn’t tell you what your body will do with the calories. …the ratio between the amount obtained by laboratory analysis and the amount declared on the product label in the Nutrition Facts panel must be 120% or less, i.e., the label is considered to be out of compliance if the nutrient content of a composite of the product is greater than 20% above the value declared on the label. As a material, food is pretty variable. The numbers that go in the nutrition labels are averages from a wide set of samples. The 20% allowance is likely a conservative value based on the typical standard deviation. You can’t actually know the calories of a particular portion of food without destructive testing. You can only estimate the calorie content based the average results for the actual measurement of other samples. the bottom line is no one has ever been able to prove you can eat more calories in and form from any food in excess and lose weight….trust I am still waiting..
No one I know is claiming you can eat in excess and lose weight. But I’ve eaten what would appear to be “in excess” of an almost-zero carb diet without gaining an ounce. I also find it easier to lose weight without hunger on a low-carb diet. Calories do NOT even exist. “Calories’ are one unit among many, many unnecessary UNITS ( Joules, BTU’S -ALL exactly the smae) all measuring the same very abstract characteristic, mathematical fiction, that WE ASSIGN a number we assign called energy Calories are purely fiction. Energy, itself, is not A-N-Y-T-H-I-N-G. Yes, I talk to physicists.
. The Blogosphere just does not understand this…… My information comes directly from Richard feynman by the way. Feynman implicitly stressed in his lectures that energy is purely mathematical, NOT any kind of stuff, thing or constituent that makes up the universe. People do NOT eat joules or calories….. People eat FOOD- MATTER- ATOMS. Energy and matter are as different as can be. Energy is only a number, matter is actual stuff- atoms.